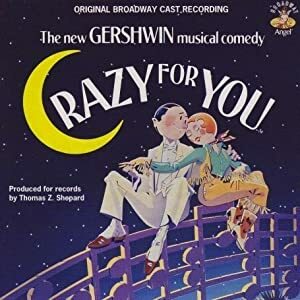 Crazy for You is a musical with a book by Ken Ludwig (http://en NULL.wikipedia NULL.org/wiki/Ken_Ludwig), lyrics by Ira (http://en NULL.wikipedia NULL.org/wiki/Ira_Gershwin) Gershwin, and music by George Gershwin (http://en NULL.wikipedia NULL.org/wiki/George_Gershwin). Set in the 1930s (http://en NULL.wikipedia NULL.org/wiki/1930s), it is the story of Bobby Child (http://en NULL.wikipedia NULL.org/wiki/Crazy_for_You), the sweet son of a wealthy New York banking family, whose dream in life is to dance on Broadway (http://en NULL.wikipedia NULL.org/wiki/Broadway_theatre). Despite protests from his battle-ax of a mother and wealthy soon-to-be-ex-fiancé, Bobby flees to Deadrock, Nevada where he falls in love with the only girl within 50 miles and achieves his dream.